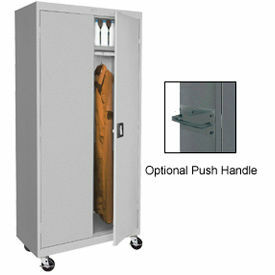 These 22 Gauge Welded Steel Industrial Strength Mobile Wardrobe Closets Are Used For Offices Or Warehouses And Feature Heavy-Duty Casters For Mobility. 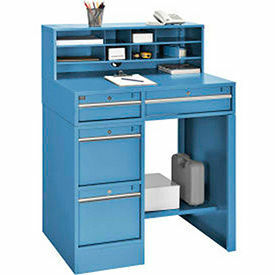 Mobile storage cabinets also include a full width fixed shelf and full width garment rod. Wardrobe cabinet shelf holds up to 230 lbs. and meets ANSI/BIFMA shelf capacity standards. Double doors lock with 3 point latching and recessed handles that prevent banging and catching with a flush surface. Portable storage cabinets feature 5 polypropylene swivel casters (2 with brakes) are attached with a 6 W heavy-gauge steel plate bolted through to 1 ¼ angle iron inside the cabinet, both running the length of the wardrobe cabinet. Steel caster components are zinc treated to resist corrosion. Total caster capacity is 1100 lbs. 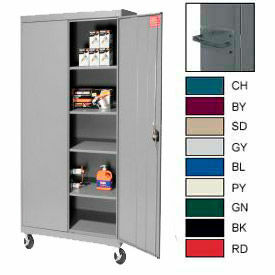 Storage cabinets are available in Charcoal, Gray or Putty durable powder coat finish. Shipped assembled. 5 Year Limited Warranty. Add the optional Push Handle for extra convenience.